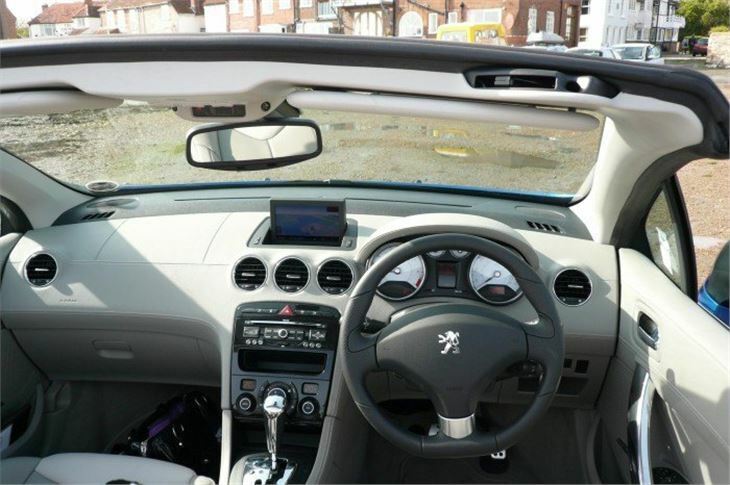 They should have issued the Peugeot 308CC with a Bank Holiday weather warning. Filming day dawned with drizzle. But the local forecast said there might be a few sunny spells by late afternoon. So we postponed the start. Got the car down to Bosham by 2.00pm. Had a late pub lunch. Then, by the time we had finished, the tide had gone out and the skies had cleared. Briefly. How better to test the robustness of an electric folding hard top? Ours upped and downed between showers completely at least 15 times. It wasn’t the fastest, taking around 20 seconds. But it certainly showed no sign of failure. And remained leak proof whatever Mother Nature chucked at it. This is, of course, the same variable vane turbo petrol engine as the MINI Cooper S, with the wick turned down by 35PS. 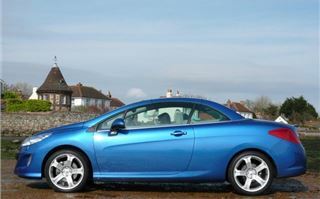 But with the four-speed autobox attached it’s still a fairly aggressive accelerator rather than a lazy old wafter. You don’t need to use the Tiptronic function at all because it will find second all by itself whenever you need to get a move on. Happily, though, it didn’t play the nasty old trick of dropping a gear half way round a corner. Unfortunately, there is a price to pay for this sporty eagerness. I reckon around 30mpg, on average, though maybe 35 to 40, cruising at 25mph per 1,000rpm in 4th, on a motorway, sticking to the limit. The combined cruise control and speed limiter (you can use one or the other) comes in very handy for avoiding speeding fines. The THP140 auto regains any lost speed up to the limit very quickly. But set the limiter to 30 in a 30 limit and you will be surprised at the tailback that builds up behind you. For some reason known only to Peugeot, our car, an SE, came on ridiculous 18” wheels with 225/40 R80 strips of liquorice wrapped round the rims. (I actually got that wrong on the video and said 245/40.) These do nothing for the ride quality, or for rattles as the car begins to age. And I very much fear for their lives on the corrugated edges of disintegrating speed cushions. But it actually says quite a lot for the basic suspension of the 308 that the car remained decently comfortable, and those tyres do hang on round the corners, even in the wet. Beauty is in the eye of the beholder and my assistant thought the 308CC sensational. You might have reservations. It can look great from the side when the sun hits it at the right angle. 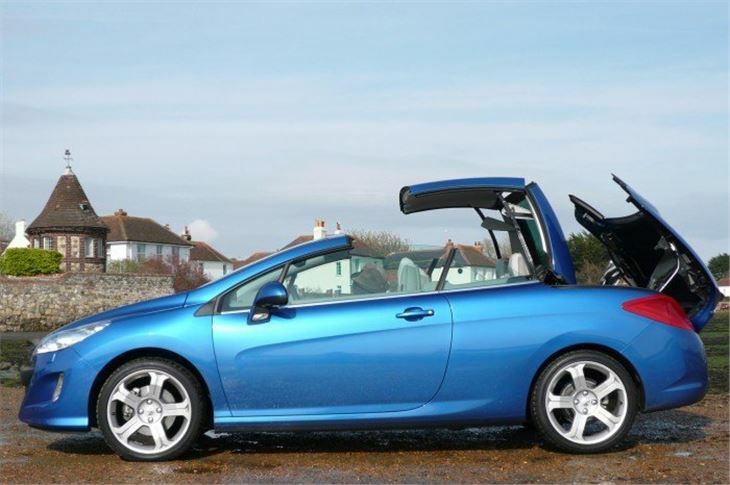 Yet, as with the 307CC, the rump has to accommodate the roof, so it’s still a question of, “does my bum look big on this?” Decide for yourself. 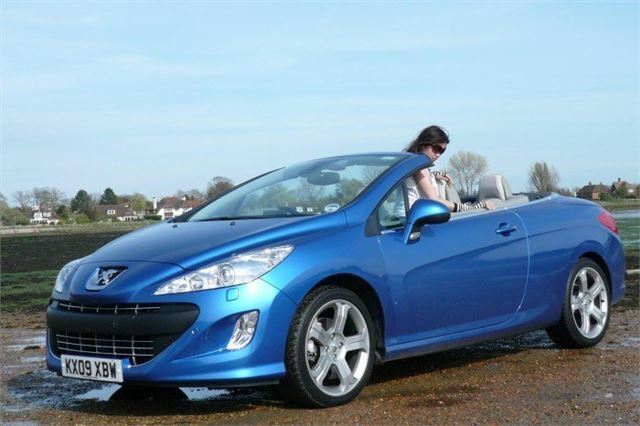 And, though Peugeot describes it as a full four seater, rear passengers have to bend their necks when the top is up. They will probably be happier getting sand blasted by sea breezes with the top down. 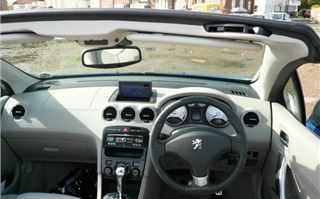 Optional on some versions, standard on others, is a gizmo that, like chewing gum, Peugeot calls ‘Airwave’. 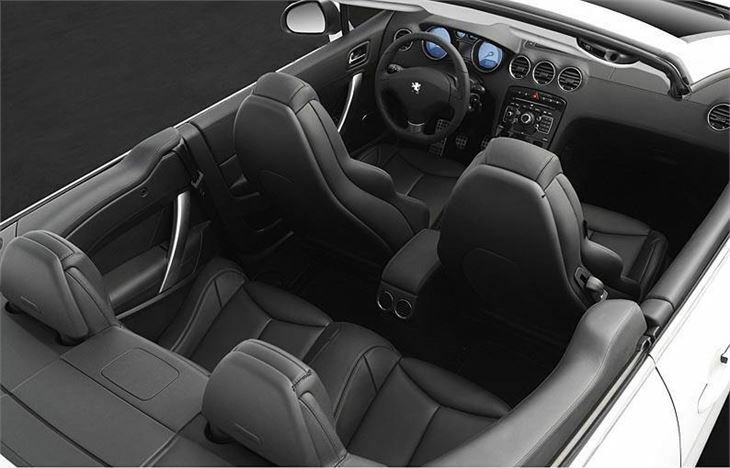 This is a small grille in the seatback designed to blow warm air onto the nape of your neck if you have the top down in cold weather. ‘Airscarf’ would have been more descriptive, but that’s someone else’s name for the same thing. As well as 120PS, 140PS and 150PS chain cam petrol engines, you can also have a 110PS 1.6 or a 136PS 2.0 belt cam diesel. Of the diesels, long experience of both in other cars would lead me to plump for the sweeter, more economical and (surprisingly) more torquey 1.6. Though you can get the 2.0 diesel with a 6 speed autobox. Back in the 1930s with its 401 Eclipse, Peugeot actually invented folding hard tops. 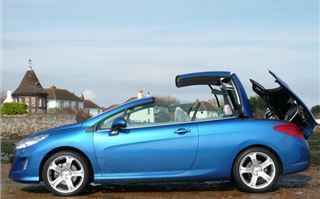 There’s no doubt these offer the option of open top motoring with the security of a vandal-proof solid top. But the multiple seals of the complex VW EOS have not stood the test of time. And, as Ford has shown with its Pininfarina two-piece Focus CC top, simplicity is not necessarily the answer to preventing leaks either. The 308CC’s top is pleasingly simple, its mechanical parts look robust, we gave it a severe up and down test, and it survived a week of overnight rain without even a drip finding its way inside. 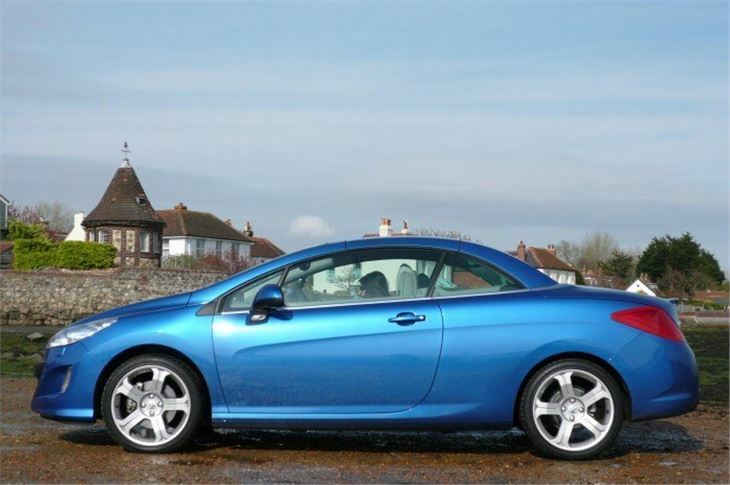 So if you’re looking for a decent handling coupe convertible with a full choice of engines and transmissions that’s also likely to stay dry inside then, fingers crossed, it will be a good choice. And there is definitely something about this car that women find attractive. I spotted a couple of them ogling it while I was having an Espresso in a cafe. And my assistant liked it so much she insisted on being driven to work in it every day. For prices, specifications, engines, transmissions, dimensions and performance figures, please click the tabs.